I have no idea where all the pics from this year are. Or even if I took more than these two. I seem to remember a lot of cider/lager being drunk this year, which might explain things... it certainly explains Wigg's knee. 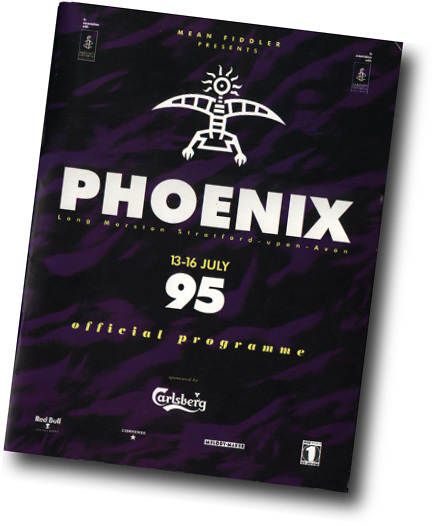 Pheonix was always a cracking festie, and '95 was no exception. One of Phoenix's best points was that it lasted four days. That's a whole extra day's drinking. 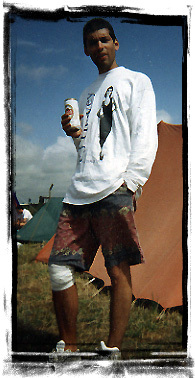 1995 saw a spectacularly drunk Wigg tidy up our campsite late on the Friday afternoon. He put loads of broken bottles in the fireplace and declared the area sfe. Then fell in the fire. "That was lucky - I could have got cut," he said. 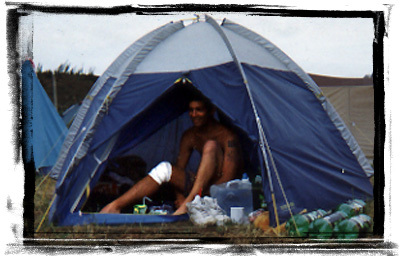 Then we saw his knee. Then it started to hurt. St John's Ambulance pumped him full of drugs that made him try to get up and dance in the rain during Suede. Bad idea. Wigg resorted to sitting in the mud for most of it.